2) The Emerging Industry of Hard Cider highlights the research projects of pomologist Dr. Gregory Peck, his colleagues, and his students at Cornell University. 3) Craft Cider Round-Up: Perries is the latest in a series by Meredith Collins for Cider Culture. 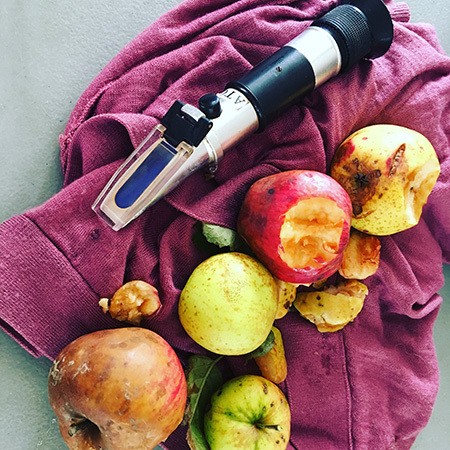 4) Beer Sessions Radio airs a Cider Week NYC episode on Still Cider featuring Steve Selin of South Hill Cider, Peter Yi of Brooklyn Cider House, and Maria Kennedy of Cider With Maria. And Cider Chat celebrates 100 Cider Podcast Episodes. 5) “People want our cider. What is our cider?” In ANXO to Make 22,000 Gallons of Cider This Year, Sam Fitz explains why the successful restaurant is ramping up in-house production. 6) Pure Gold: Liquid Alchemy Beverages features the cidery/meadery from Wilmington, Delaware. Western North Carolina cider scene continues to grow thanks to 150 orchards in Henderson County (near Asheville). And Paradise Ciders in Honolulu is Hawaii’s First Locally Made Hard Cider. 7) CBC News gets to the core of the Ontario craft cider industry. The province is home to 60+ cidermakers and has a strong track record of success at GLINTCAP. 8) Magners Original Apple Cider wins top prize at Australian Cider Awards. And the late Drew Henry (of Victoria’s Henry of Harcourt) was honored by Cider Australia with its inaugural Champion of the Industry Award. 10) Along Came a Cider reviews Slyboro Kingston Black. Cider Says reviews Domaine de la Minotière Cidre Fermier Bio Doux, Cidrerie Daufresne Poiré, Le Brun Poiré, Liberty Ciderworks Spokane Scrumpy, and Manoir de Grandouet Cidre Fermier Brut. Cidercraft reviews McClure’s Orchard Spy Candy. The Milled Apple reviews Stump City Wicked Good and Seattle Cider Co. Dry. Cider Society reviews Sonoma Cider The Jax, Metal House Cider, Hardscrabble Cider The Standard, and Graft Cider Light & Day. The Cider Drinker reviews Hoxton Cidersmiths Bristol Draught. And Cider Explorer reviews Divoké Jablko Cidre Brut, ApfelDieb Satter Apfel, and Thronprinz Cider.